When you think of Coca-Cola at Christmas, the image that comes to mind is probably that of polar bears holding coke bottles. Did you know that the beverage king also has a Christmas tree in Singapore this festive season? You will find the Coca-Cola Christmas tree at popular teen hangout Orchard Cineleisure. The tree’s décor is kept simple with hanging ornaments that include Coca-Cola bottles, trucks and gift boxes interspersed with red and gold baubles. In place of the usual star at its tip is a round Coca-Cola logo. The tree sits on a base of a striking red Coca-Cola cube. That’s not the only Coca-Cola-branded item you would find at the mall. 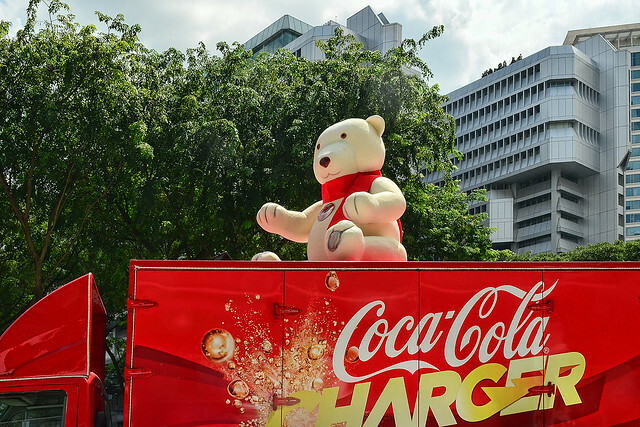 Near its entrance, the Coca-Cola bear can be seen greeting shoppers. While we’re on the subject of Coca-Cola Christmas trees, here’s another amazing Coca-Cola tree that I spotted in Bangkok Christmas 2009. It’s fully made out of aluminium drink cans!